Here's the latest schedule. Hope to see you there—here are still some spots to left, so you can still register—and if you're a volunteer with or staff person at a history organization, such as a historical society or museum, I hope you'll attend my session at 11:15 am: "Marketing and communications tools for historical societies and other history organizations." 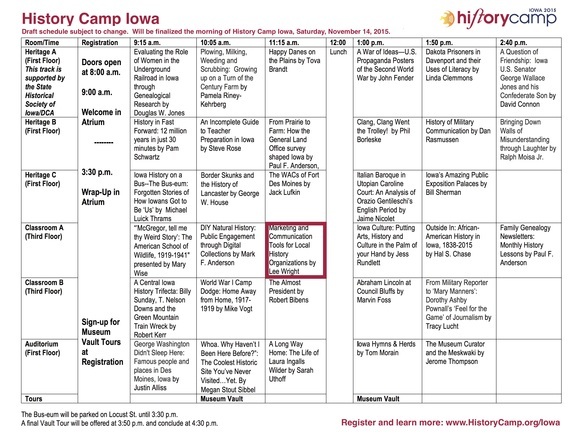 Download the latest schedule from the History Camp site. See you Saturday! And if you haven't saved your spot yet, register now. Thanks to the Rhode Island Historical Society, the Newport Historical Society, and the folks at the other participating institutions who have helped launch our latest weekly guide, "Guide to History Events in Rhode Island," which was announced formally this morning in this press release. Organizations interested in participating can learn more and sign up, and individuals can subscribe here. History Camp Iowa is November 14 at the State Historical Museum in Des Moines, with 27 sessions covering a wide range of topics. And there's still time to register. Join us in helping to get the word out. Download the flier, post it at your school or the local coffee shop or book store, link to it in social media posts, and send it to others. In April I announced that the next History Camp would be in the Midwest: History Camp Iowa at the Iowa History Museum in Des Moines. History Camp Iowa takes place at the Iowa History Museum in downtown Des Moines, near Iowa's beautiful state Capitol (bottom photo).